Think the Nation's budget deficit is bad now? Just wait a few years, and you might be longing for the days when we only had a trillion dollar budget deficit. 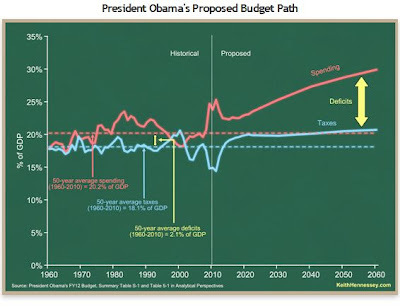 This is the depiction that a few bloggers are painting after reviewing President Obama's proposed Budget. For more on this, read the following post from The Mess That Greenspan Made. Following this item about David Stockman’s views on deficits comes a shocking depiction of where the nation’s finances are currently headed via this story by Robert Murphy at the Mises blog, the chart below originally appearing in this item from Keith Hennesey. Oh yeah, and the budget projections for the next ten years are just filled with optimistic assumptions about the U.S. economy that many outside the White House characterize as anything from fanciful to dangerously detached from reality. This post was republished with permission from The Mess That Greenspan Made.